Hey folks, this is going to be a fairly straightforward article about what to expect, what the probabilities are, and how to prepare for Sunday’s (March 13) big windstorm forecast. The weather forecast models are in general agreement on the windstorm. What is very unique about this forecast, is that for the first time I’ve ever seen, the computer generated weather models are in good agreement with each other – and themselves – after each run. From the European, to the Canadian, to the US NOAA, to the UW models; every run shows strong winds for the Puget Sound. The National Weather Service in Seattle has issued a High Wind Watch for most of Western Washington from Sunday afternoon to Sunday night concerning winds of 20 to 40mph with gusts to 60. The strength of the winds will depend on the track. One of the most crucial aspects of a northwest windstorm is the track that it takes once it makes landfall on the coast. 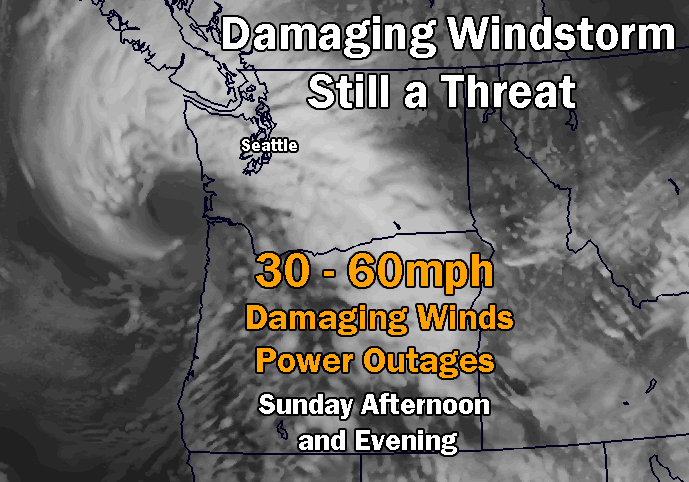 If the storm wobbles or shifts 50 miles or so, the strength of the winds can change dramatically. We’ll be watching for a landfall on the northern or central Olympic Peninsula that then cuts towards the northeast, causing strong winds to rush through the Puget Sound. Even with the model agreement, the forecast is not 100% certain. As stated above, the slightest changes in the development of the storm can and will alter the strength and impact of the storm, it could be stronger it could be weaker. This is definitely something to start preparing for. These kinds of storms are very exciting for weather geeks like me, but also very worrying. People can get hurt or even killed, and the only way to prevent injuries or deaths is knowledge and preparation. If the strongest possibilities become reality, widespread power outages will be certain. Prepare yourself for long term power outages with water, food, batteries, warm clothes and blankets. Here is a PDF by the City of Seattle detailing how you should Prepare for Windstorms. I will be running a live stream with the latest updates and discussion about the storm. Link will be posted here soon.